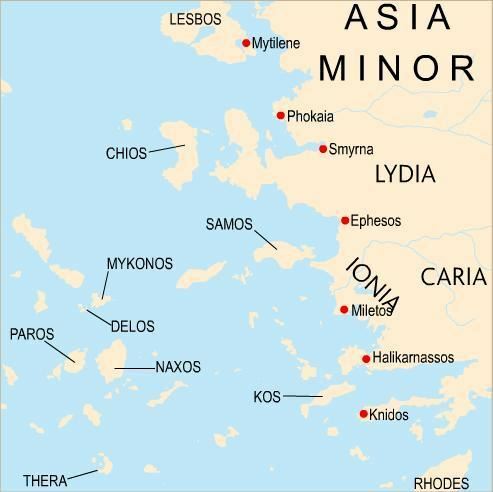 Ionia lies in central Western Anatolia (Asia Minor) on the shores of the Aegean Sea. The region is rather small and mountainous, unsuited for agriculture but excellent for seafaring. Greek settlement took place in the 11th to 10th Centuries B.C. despite hostilities with the native Luwians. The Ionians were gradually conquered by the Lycian and later the Persian Empire, but was freed by Alexander and became a contested prize for the Hellenistic kings, until the last king of Pergamum bequeathed his land to Rome. Ionia offered the world countless philosophers and men of science, and a fabulous school of art. This category covers the cities of Colophon, Ephesus, Magnesia ad Meandrum, Miletos, Phokaia, Smyrna, and more.